Bua Geow's story is as old, perhaps, as the banks of the river Ping, in northern Thailand, alongside of which her family has raised rice and garlic for a hundred years. It is a brutal tale; a bright-eyed slip of a country girl; bright lights, big city; enslavement; debasement; and a brush with death. John Shaw's philanthropic bent is also as much a part of the human condition, one hopes,as is greed. Sometimes the role of sympathetic bystander simply isn't enough. Opportunities to lend an influential hand appear; they must be taken. And, to Bua Geow's story, we can now add salvation. 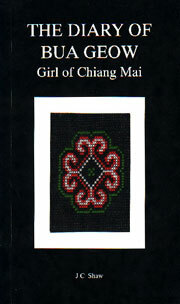 My name is Bua Geow and I live in the village of Mae Tang, in the Province of Chiang Mai, in the north of Thailand. I was born in the second lunar month, that is to say December, and I am nineteen years old. My parents can not remember the day on which I was born, nor did they register my birth, so I can not have a birthday party nor can I have my horoscope read; perhaps it does not matter. I live with my mother and father, elder brother, and two older sisters, one of whom is married with two children. I will not write of my childhood as I can remember very little about it and what I do remember was not very interesting. What I write in the future will do very well to show what my life was like in the past. When I was seven I went to the wat school. Since this was in the next village it meant half an hour's walk, morning and evening; many children had much further to come. I enjoyed my six years at school, made many friends and luckily learned to read and write tolerably well. During the long Songkram holiday in April which marks our New Year, although the real New Year when the first month begins is in November or December depending on the moon, and now, of course, the official New Year, which we also celebrate, is on January the First, Sak, who is a distant cousin, came to visit us from Bangkok. Sak was smartly dressed in tight fitting jeans held up by a leather belt with a large gold buckle, a bright blue shirt with a crocodile on it, pointed shiny shoes and long shiny hair. He showed off his city superiority, laughing at his parents and the stupid villagers who lived such a poor and ignorant life. He very much impressed me and my best friend, Lynn. Lynn and I had planned to save up and each buy a sewing machine so that we could start a small business making clothes to sell in the village. We thought it would take us three years of hard work to make enough money. When we told our plans to Sak he roared with laughter and said that we could save the B3,000 that we each wanted within three months in Bangkok. He had a friend who owned a restaurant and was looking for waitresses. We could live there free and the tips were good. "In fact," he said, "my friend asked me to bring two pretty girls back with me. He even advanced the money to pay for their train fares." We did not take much persuading and our parents readily agreed since Sak was a relative and clearly a prosperous and sophisticated one. We spent the last of our savings buying a few clothes and shoes that we thought would be suitable for Bangkok. We set gaily off in the minibus, our few possession stuffed into plastic bags. Chiang Mai Station,the end of the northern railway line, was bustling with passangers busy buying sticky rice and roast chicken or pork for the long night journey. In the evening sunlight, the train rolled noisily along the valley to Lamphun, through the dried up rice fields and past the rich lamyai orchards, heavy with sweet smelling blossom. Doi Suthep was lost in the distance, and then began the slow climb up the mountains. We watched the girls, girls like us, leading home the buffaloes, watering the vegetables from two heavy cans suspended from a pole across their shoulders or washing themselves in the streams. Oh, how superior we felt riding by on our way to a grand life in Bangkok! By the time we reached Kun Tan and the tunnel at the top of the pass it was nearly dark, and I remember that the little wild orchids, held up to the train windows by children, looked like small sticks of light. For the rest of the night journey we dozed on the wooden seats, pleasantly half awakened as the train jerked to a halt in Den Chai, Pitsanaloke, Ayuthya or one of the other stations, at all of which were people selling coffee, sweets or sticky rice - oliang, kanom,khao nieow - they called as they walked past the windows. And so, on a hot April morning, we arrived at Hua Lampong, the station of Bangkok, or as it is called in Thai, Krung Thep, the City of Angels, the city of our hopes.